Tip #1: Get a copy of your prescription and have your doctor note your PD on it. Your eyeglass prescription is only good for two years, and many websites will want to see a copy before filling your order. Make sure your prescription is up-to-date, and make sure that your pupillary distance (or “PD”) is noted on the prescription. Your PD is the measurement between your left and right pupils, basically how far apart your eyes are. The online retailers will need this to know where to center your prescription in the lens. Most of the time, your doctor won’t note your PD on your prescription because the staff at their optical shop will measure it for you while you’re there buying your glasses. If your PD is not on the copy of your prescription that you have right now, call the office and ask for it to be added. Your doctor will most likely say something about how it’s not a good idea to order glasses online—my doctor wrote “not responsible for glasses purchased on the internet” on my prescription—but don’t listen to them. They just want you to pay eight times more and order glasses from their shop. 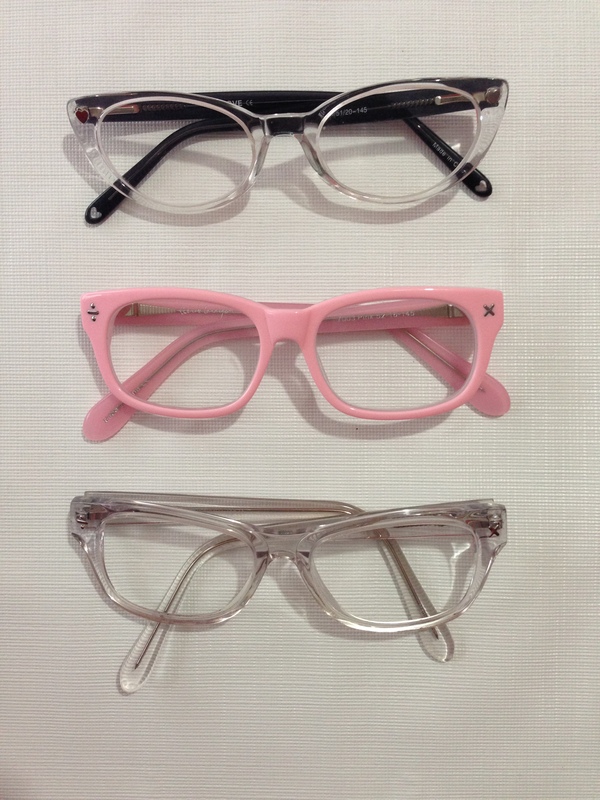 Tip #2: Look at the glasses you have now, for comparison. Put them on your face and look in the mirror. How do they look? Are they too big? Just right? What do you love about them? What bothers you? Now check the numbers inside the temple. You should see three numbers. Mine say 51/20/145/ 51 is the width of one, single lens. 20 is the width of the bridge (the part that connects the two lenses over your nose). 145 is the length of the temple arm. Do your glasses slide down your face all the time like mine do? Look for a pair with a shorter temple. I usually try to keep my temple length around 130, but I loved these frames so much I was willing to put up with the slipping. Write down the measurements for your frames and keep them nearby when you’re browsing for new frames. The websites will all list the measurements of the frames you’re looking at, and you can compare them to your current glasses to gauge the size and approximate fit to your face. Many sites have “virtual mirrors” or other virtual try-on gadgets, but I’ve never had luck with them because they don’t adjust for scale and never give you an accurate picture of how the glasses will look. Tip #3: Search Flickr and Instagram for photos of the frames in real life. 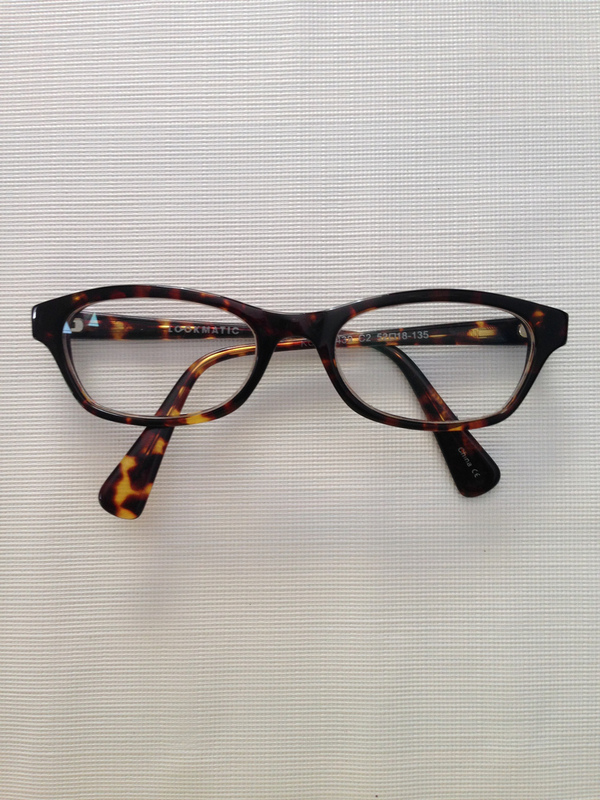 Want to know what the frames you love look like on real people in real life? Search for images. Go to Flickr and search the retailer name and the frame style name. Check Instagram for hashtags of the retailers names. You won’t have luck with many of the lower-end websites, but the pricier ones, especially the sites that offer free at-home trials of frames will have oodles of photos available. Tip #4: Search for coupon codes. Although you’re going to pay drastically less for online prescription glasses than you would at your doctor’s office, it’s still nice to get a good deal. Before you commit to buy, Google “coupon code” and the name of your retailer. Most of the codes you’ll find are bogus, but if you keep trying, you may find one that works. I once found a 30% off code that was given out on the QVC website after the retailer appeared on the channel. Score! Tip #5: Adjusting your glasses. This is always a big question—what if my glasses don’t fit? Your glasses will not arrive perfectly adjusted to your head. You will either need to adjust them yourself, or have them adjusted for you. 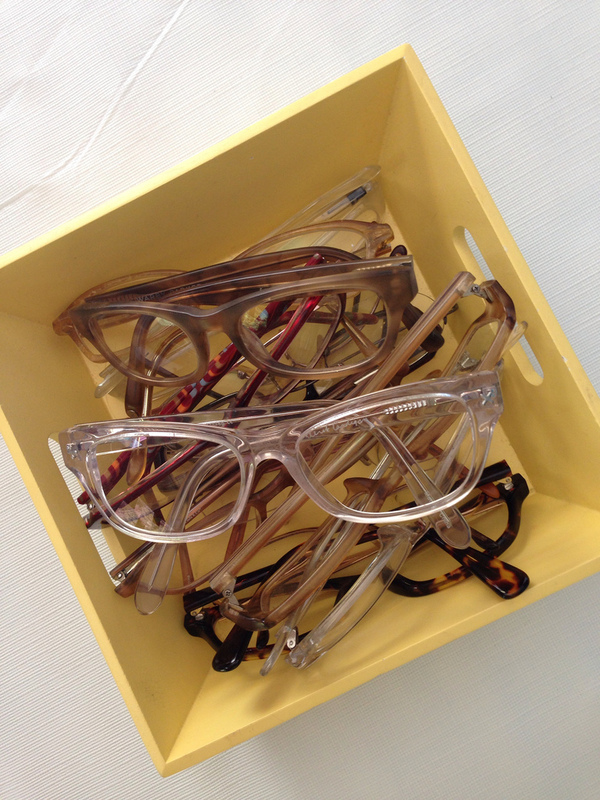 Most optical shops, and even your local LensCrafters store will adjust your glasses for you. Occasionally they may charge you a few bucks for glasses that weren’t bought at their shop, but it can be worth it if you’re too scared to mess with them yourself. I adjust mine myself, but it’s taken some practice to get it right. If you want to try it yourself, I suggest you watch any of the countless YouTube videos about adjusting your glasses. Here’s a good place to start. My favorite method is pouring boiling water into a tall glass and dipping the temples in until they’re pliable enough the bend. Depending on the material your glasses are made from, sometimes a hot hairdryer is the best tool. And now for the fun part… the shopping. I’ve bought probably 20-30 pairs of glasses online and have found some favorite websites that I like to recommend. 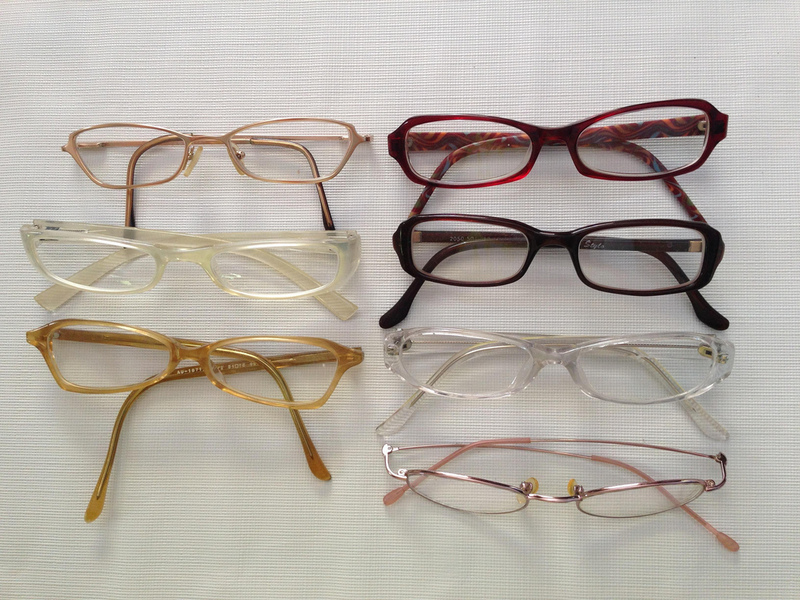 They each have their specific strengths, so let me show you the glasses I’ve gotten from each and tell you a bit about the sites. But first, this picture above is a peek at maybe half of the glasses I’ve purchased, not including the prescription sunglasses. I may have a problem. Zenni is great for cheap frames. Like $6 cheap. This price includes single-vision lenses, but you can add on options like anti-reflective coating and tints for a small additional fee. Shipping costs are minimal and quality has been great. The materials aren’t totally top of the line, so if you wear them every day, you may need to have them adjusted more often, but come on. A pair of prescription glasses for under $10? You won’t hear me complaining. Here are some of my Zennis, in real life. 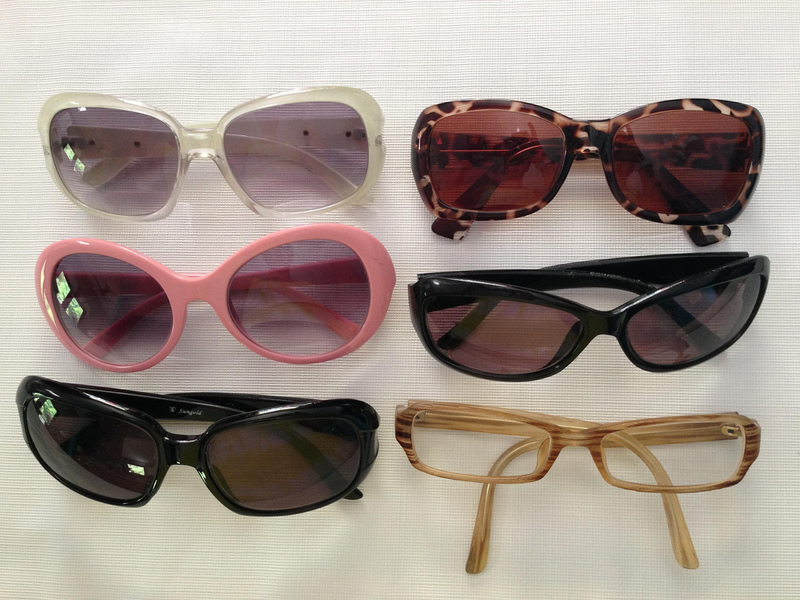 Global has a great selection of actual sunglass frames, not just eyeglass frames that they will put tinted lenses into. The price listed for Global’s glasses includes single-vision lenses, but you’ll have to pay a bit more to add the tint to the lenses. (I usually go 80% gray.) (Just like my hair! Zing!) Most of the sunglasses I bought were about $25 plus shipping, which makes it not so painful when you turn your head while riding a motorcycle and your sunglasses get whipped off your face and run over by the car behind you. Or so I’ve heard. Here are some of my Global frames, in real life. Lookmatic was my first foray into the world of higher-end online glasses. One of my favorite blogs, Cup of Jo, often has Lookmatic giveaways and I quickly fell in love with this pair, called Slims. (And oh man, I went on Lookmatic to find a link to the Slims and instantly fell for this pair, called Ace. Swoon…) Lookmatic’s glasses are $95 for single-vision anti-reflective lenses, and the shipping is free. Here are my Slims, in real life. 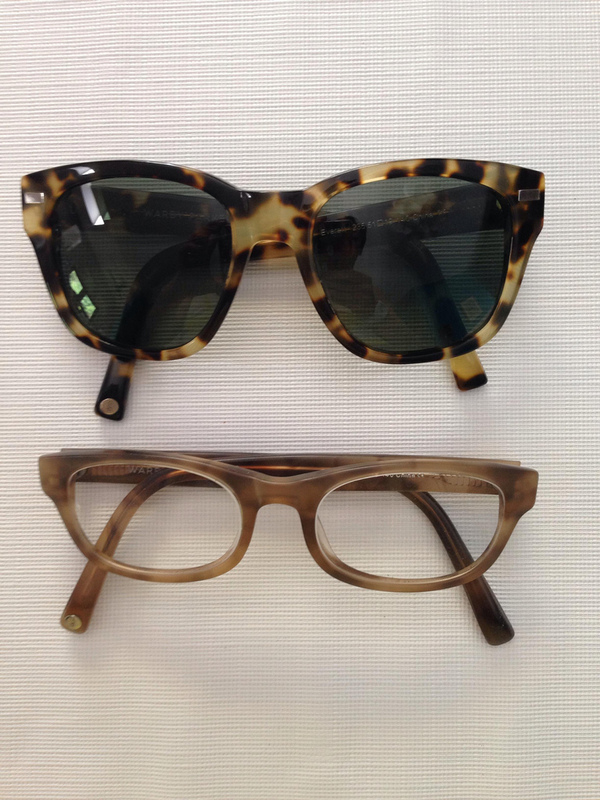 I love everything about Warby Parker. They’re funky and fun; they make amazing quality eyeglasses; they will send you five pairs of you choosing to try on at home for free; they sell a monocle (measured in furlongs); and for a past April Fools Day, they launched a fake site called Warby Barker with glasses for dogs. My first pair of Warby Parkers were polarized prescription sunglasses. I ordered my try-on selections and had a fun week of taking endless photos of myself in various frames and locations until I finally decided on the Everetts you see above. I was so impressed with the quality and the customer service that I ordered a pair of everyday glasses, the Sims above (although the color of my frame doesn’t seem to be available anymore). Single-vision, anti-reflective lenses (for non-sunglasses) are $95, polarized sunglasses are $150 and the shipping is free. Whee! Here are my Everetts and my Sims, in real life. I stumbled upon Coastal when I was obsessively searching for a good deal on prescription Ray Bans. They do have prescription Ray Bans, but what I actually got from them was my absolute favorite pair of glasses. And they were nearly free. Coastal offers you first pair free, but you have to pay a processing fee and shipping, which came out to just under $20. The quality of the frames is amazing and they’re the glasses I get the most compliments on. Although they don’t say they are, the lenses appear to be anti-reflective, so don’t order up to the special lens package because the standard lens is top notch. I recently ordered two more pairs when they had a two for $95 sale and I’m just as happy with me new pairs as I was with the first. Here are my Coastal frames, in real life. Gaffos is, by far, the most expensive site I’ve ordered from, but as I said above, I was looking for a very specify Ray Ban sunglass frame and Gaffos sold it with the Ray Ban certified polarized prescription lenses in them, so I splurged. At $220, they’re the most expensive pair I own, but still far cheaper than they would have been if I ordered them from my eye doctor. Gaffos has many high end brand names, so if brand names are what you’re looking of, Gaffos is a good place to look. There are often ads on Facebook for Gaffos, so keep an eye out for coupons and offers to lower the price. 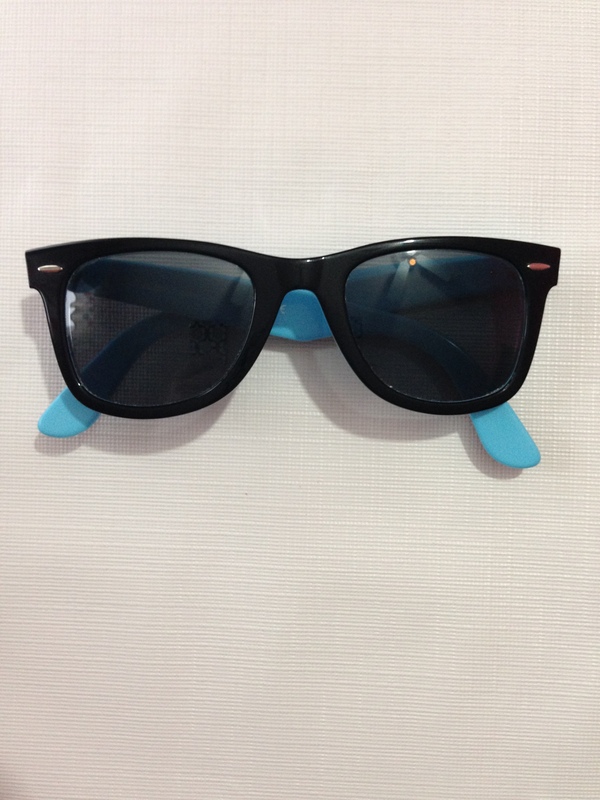 Here are my Ray Bans, in real life. So there you go. That’s my shortlist, do you ave any sites to add? Have you ordered glasses online? Have any tips to add? Next Post → Blogging…Is This Still A Thing We Do?